It's our last day of the My Creative Time 62nd Edition sneak peeks! Tomorrow is the day you can finally see this awesome release in its entirety and get shopping! But first, we have one last die set for you to get a glimpse of today. 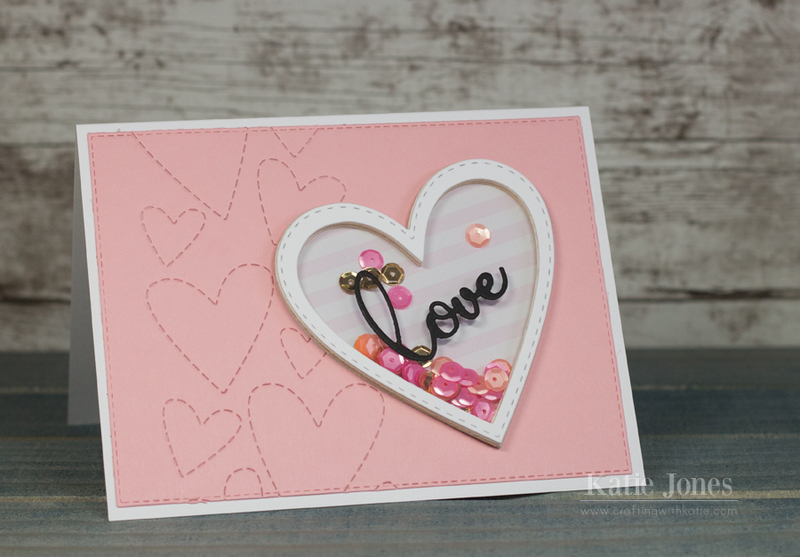 It's called Heart Love Note, and it is such a pretty Valentine set! Heart Love Note includes three dies that are great for making a shaker element: a stitched heart, a stitched frame heart, and the word "love." I used the stitched heart to cut a piece of striped patterned paper. Then I used the framed heart to die cut four layers of frames from Papertrey Ink's coasters, which gave it a nice thickness. I filled the inside with some Neat & Tangled Pixie Dust Sequin Mix. Then I added a clear cardstock heart made with the stitched heart die, and on top of that, one more framed heart, this time cut from white cardstock. I also glued "love," cut from black cardstock onto the clear cardstock. I made a layer for my card base using one of the Stitched Rectangular Frame Dies and the Stitched Heart Background Die. After adhering this to my white card base, I added the shaker element. So fun! Oh Miss Katie What Gorgeous Shaker card! I am loving your embossed heart base and your shaker is so beautiful with all of your sweet shaker bits Everything sure in Pretty In Pink!! You so did an outstanding Creative Shaker Job!! So cute!!! Love the shaker!!! You created such a pretty shaker card!! I just LOVE the sequins!! I will have to get some of those pretties!! Very pretty shaker and I like the stitched heart background. Love the background of hearts. The shaker heart is so pretty. Your shaker card is so beautiful. This set is perfect for that. Wow.. this is a gorgeous shaker card! I love how beautiful those stitched hearts are and the gorgeous colors of the sequins! Such a beautiful shaker card! I like the stitched hearts background as it does not take away from the pretty shaker heart. Great sequins too! Beautiful card! I love the white accent heart for the shaker and the colors of sequins you used. The stitched hearts in the background too. Such a lovely sweet card! Pretty card with pretty colors, I love that stitched heart background!